Gov. Ned Lamont and Department of Transportation Deputy Commissioner Anna Barry visited the area near Exit 9 on I-95 in Stamford, where over two weekends this summer the state will utilize a cost-effective and innovative method to replace a two-span bridge that carries Route 1 (East Main Street) over I-95. 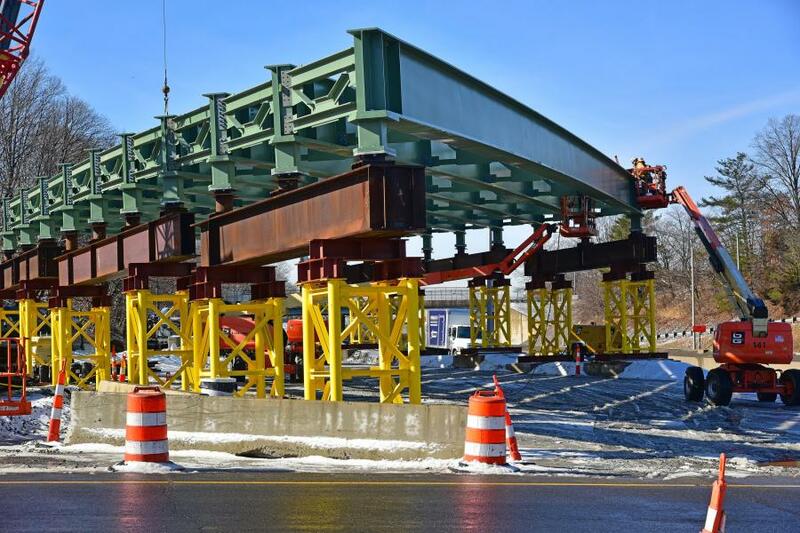 Utilizing a method known as accelerated bridge construction, the project involves the removal of the current spans, which have outlasted its lifecycles, followed by the sliding in of new ones in a period of only two weekends. This method will significantly speed up the installation of the replacement bridge, thus cutting by considerable amounts the resulting period of traffic congestion that traditional construction methods would have caused. The project will be held on the weekends of June 1 and 8. Although motorists traveling through the area will be detoured, state officials want to get the word out well in advance so that motorists can experience the least amount of inconvenience. "We have an aging infrastructure in our state that is in dire need of replacement — this project is a perfect example of what we need to do just to maintain our existing roads and bridges," Lamont said. "Every day, thousands of commuters use this highway to get to work so they can support their families and maintain a decent quality of life — deciding whether to keep this critical highway in a state of good repair is simply not up for debate. For the sake of our businesses and the sake of our jobs, we must provide Connecticut with a modernized transportation system that works, which requires a sustainable, recurring funding source." "We are using an innovative construction method that will limit detours to two weekends," Barry said. "If traditional construction methods were used on this project, motorists would face delays for two years. It's exciting that our department and state are using modern and cost-effective construction methods to rebuild infrastructure while minimizing overall impacts to motorists and business." The project is being led by O&G Industries, a business based in Torrington. During the two weekends of construction, Route 1 will be closed between Courtland Avenue and Seaside Avenue, and traffic will be detoured from Route 1 to Courtland Avenue and Hamilton Avenue. Exit 9 off of I-95 in Stamford also will be closed. To allow for the removal and replacement of the bridges, I-95 will be reduced to two lanes in both directions on both weekends beginning at 9 p.m. on Friday and reopening by 5 a.m. on Monday morning. Traffic will be detoured onto and off of the Exit 9 ramps to allow I-95 to remain open during construction, but speeds will be reduced to 20 mph. Motorists will be advised to seek alternate routes. For additional information and updates on the project, visit i95exit9.com. With gasoline taxes, which serve as the primary source of funding for the state's transportation system, delivering less dollars, budget analysts for years have been warning that Connecticut's transportation fund — along with a number of other states throughout the country — is on track to become insolvent unless a new revenue structure is created. Gov. Lamont said that he does not support raising the gasoline tax, which he believes is already too high, nor the use of "priority bonding" that would borrow to support transportation funding and add to the state's debt. In his budget address in February, the governor began a discussion with the legislature on returning tolls to Connecticut, which had been removed in 1985. Connecticut is one of only two states on the eastern portion of the country that does not have a system of tolling to support its transportation system. Gov. Lamont put forward two options — one that would toll only trucks and could generate $200 million annually if applied to all of the state's major highways, and a second option that would apply to both trucks and cars, and generate $800 million annually, under which Connecticut drivers who frequently travel on major roadways in the state would receive a maximized discount. Estimates say that about 40 percent of tolling revenue for Connecticut could come from out-of-state drivers. "We foot the bill when we travel through neighboring states, it's time out-of-state drivers do the same for Connecticut," Gov. Lamont told lawmakers during his budget address. The proposals are currently being considered by the General Assembly.